German orbital launch vehicle. 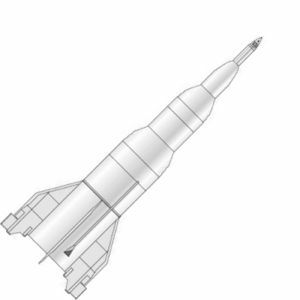 The A12 has been named as the designation for a true orbital launch vehicle, as sketched out at Peenemuende. It would have been a four-stage vehicle consisting of the A9+A10+A11+A12 stages. Calculations suggest it could have placed 10 metric tons into low earth orbit. Status: Study 1944. Payload: 10,000 kg (22,000 lb). Thrust: 83,400.00 kN (18,749,000 lbf). Gross mass: 4,100,000 kg (9,000,000 lb). Height: 70.00 m (229.00 ft). Diameter: 11.00 m (36.00 ft). Span: 23.00 m (75.00 ft). Apogee: 300 km (180 mi). The reconstruction here is purely an estimate, assuming the A12 stage followed the design philosophy of the A11 drawing. Unless development of a new engine was planned, no fewer than 50 A-10 engines would have been required in the first stage, presaging Von Braun's design of 1948/1952. LEO Payload: 10,000 kg (22,000 lb) to a 300 km orbit at 90.00 degrees. Stage 1. 1 x A-12. Gross Mass: 3,500,000 kg (7,700,000 lb). Empty Mass: 350,000 kg (770,000 lb). Thrust (vac): 98,000.000 kN (22,031,000 lbf). Isp: 247 sec. Isp(sl): 210 sec. Diameter: 11.00 m (36.00 ft). Span: 23.00 m (75.00 ft). Length: 33.00 m (108.00 ft). Propellants: Lox/Alcohol. No Engines: 50. Engine: A-10. Status: Study 1942-1945. Comments: All values estimated. Stage 2. 1 x A-11. Gross Mass: 500,000 kg (1,100,000 lb). Empty Mass: 75,000 kg (165,000 lb). Thrust (vac): 13,841.380 kN (3,111,666 lbf). Isp: 247 sec. Burn time: 70 sec. Isp(sl): 210 sec. Diameter: 8.10 m (26.50 ft). Span: 16.50 m (54.10 ft). Length: 25.00 m (82.00 ft). Propellants: Lox/Alcohol. No Engines: 6. Engine: A-10. Status: Study 1942-1945. Comments: Masses estimated; dimensions scaled from drawing. Stage 3. 1 x A-10. Gross Mass: 69,043 kg (152,213 lb). Empty Mass: 16,993 kg (37,463 lb). Thrust (vac): 2,306.896 kN (518,611 lbf). Isp: 247 sec. Burn time: 55 sec. Isp(sl): 210 sec. Diameter: 4.12 m (13.51 ft). Span: 9.00 m (29.50 ft). Length: 20.00 m (65.00 ft). Propellants: Lox/Alcohol. No Engines: 1. Engine: A-10. Status: Study 1942-1945. Stage 4. 1 x A-9. Gross Mass: 16,259 kg (35,844 lb). Empty Mass: 3,000 kg (6,600 lb). Thrust (vac): 288.678 kN (64,897 lbf). Isp: 255 sec. Burn time: 115 sec. Isp(sl): 220 sec. Diameter: 1.65 m (5.41 ft). Span: 3.20 m (10.40 ft). Length: 14.18 m (46.52 ft). Propellants: Lox/Alcohol. No Engines: 1. Engine: A-9. Status: Development 1945. Family: orbital launch vehicle. People: von Braun. Country: Germany. Spacecraft: A-9. Launch Sites: Peenemuende. Stages: A-10, A-11, A-12, A-9 stage. Bibliography: 218, 394, 693.